Bullfighting: Great longform articles about matadors, rodeos, and a very bad hike. The Longform guide to bullfighting and bull riding. 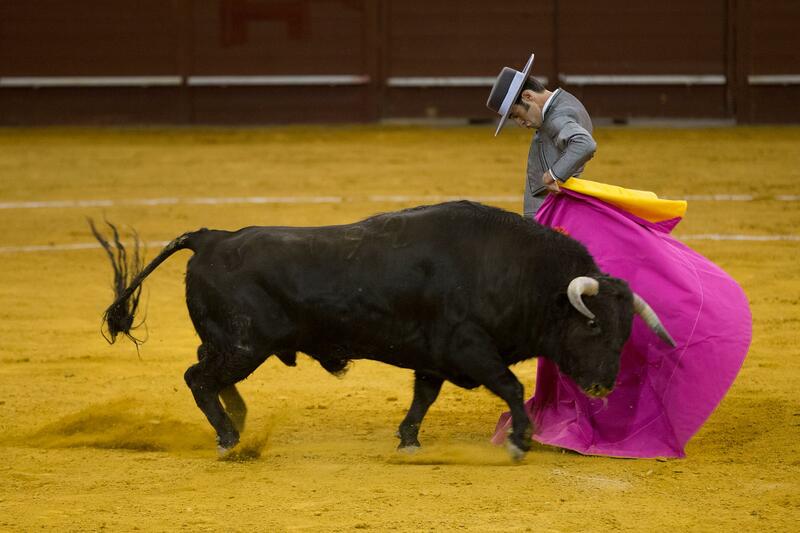 Spanish bullfighter Alejandro Talavante performs during the Bullfighting Charity Festival in Madrid on March 22, 2014. How Juan José Padilla came back from one of the most horrific injuries in the history of bullfighting. Soon everyone can tell from the bull’s ragged breathing that the end is near. Padilla and the bull are staring into each other’s faces with an opaque intimacy. Something visible to everyone in the stands, but as ultimately impenetrable as any couple’s love-or-hate affair. It’s almost sunset now; the planks of blood down the bull’s back look violet. As if on the conductor’s cue, two seagulls choose this moment to swoop through the invisible membrane between bull and man. Padilla’s dark hair is sticking to his head. The matador, underweight, with his twisted face and his eye patch, appears unmistakably mortal. His face fossilizes his brush with death, the way that fire gets incarnated by cold, tender welts. His return to the ring, one could argue, gives the crowd a sense that death will come for all of us, sooner or later, that death is certainly imminent, but it ain’t here yet. On the amateur rodeo circuit. That bull is crazy, people are saying. There is something wrong with that bull. Billy thinks, Well, it’s not the bull’s fault. Let him calm down. Okay. Billy puts one leg over, lowers himself, gets on again, wraps his bull rope around using the split-finger wrap that eight-time world champion Donnie Gay himself once taught him. And Five, he’s snorting. Twitching something fierce. Trying to communicate something. Something like, “That’s it. Off with the cowboy. I am not a goddamn monster here to perform some circus trick. I am a bull–a mighty, mighty bull–and whoever the hell you are on top of me, I will be rid of you.” He leaps, curls, stomps, and Billy gets sucked down into the chute beside the bull, where there is just a sliver of space into which a man of some 155 pounds can slide. And all the cowboys united in the code, united throughout time, they’re trying to save Billy, reaching for him, but the bull throws his head high and knocks them onto their backs. But somehow one of them gets up, somehow he reaches in, reaches in and finds the cowboy drowning in there with that crazy bull, getting sucked into the drain of madness, and he pulls, he pulls and pulls with both arms, bringing Billy out of there, back up out of there, back to him. A ringside report from Spain. Then, ducking his head as he came up out of the dark pen, a bull came into the arena. He came out all in a rush, big, black and white, weighing over a ton, and moving with a soft gallop. Just as he came out the sun seemed to dazzle him for an instant. He stood as though he were frozen, his great crest of muscle up, firmly planted, his eyes looking around, his horns pointed forward, black and white and sharp as porcupine quills. Then he charged. And as he charged, I suddenly saw what bullfighting is all about. A profile of a 25-year-old Spanish sensation. What I really wanted to know was why in the world she decided to become a bullfighter. I knew she’d grown up watching her father fight, so it had always been a profession that seemed normal to her, even though at the ring she didn’t see many girls. Plus she doesn’t like to sit still. Before she started training to be a matador, she had worked in a beauty parlor and then as a typist at a fire-extinguisher factory, and both jobs drove her crazy. She is a very girly girl–she wears makeup, she wants children, she has boyfriends–but she says she could only imagine doing jobs which would keep her on her feet, and coincidentally those were jobs that were mostly filled by men. If she hadn’t become a matador, she thinks she would have become a trainer at a gym, or a police officer, or perhaps a firefighter, which used to be her father’s backup job when he was a bullfighter, in the years before he started advising her and became a full-time part of her six-person crew. She didn’t become a woman matador to be shocking or make a feminist point, although along the way she has been shunned by some of her male colleagues and there are still a few who refuse to appear in a corrida with her. A hike gone terribly wrong. The real Reality was not such a moment, not touched in the least by ambiguity or illusion. I had, indeed, just emerged from the mist, and was walking around a boulder as big as a house, the path curving around it so that I could not see ahead, and it was this inability to see ahead that permitted the meeting. I practically trod on what lay before me—an enormous animal sitting in the path, and indeed wholly occupying the path, whose presence had been hidden by the rounded bulk of the rock. It had a huge horned head, a stupendous white body, and an enormous, mild, milk-white face. It sat unmoved by my appearance, exceedingly calm, except that it turned its vast white face up toward me. And in that moment it changed before my eyes, becoming transformed from magnificent to utterly monstrous. The huge white face seemed to swell and swell, and the great bulbous eyes became radiant with malignance. The face grew huger and huger all the time, until I thought it would blot out the universe. The bull became hideous—hideous beyond belief, hideous in strength, malevolence, and cunning. It seemed now to be stamped with the infernal in every feature. It became, first a monster, and now the Devil. A first-person account of Louisiana’s prison rodeo. I’ve come to Angola for the area’s biggest tourist attraction: the sole surviving prison rodeo in the country. Five Sundays a year, thousands of visitors drive down this road toward an inmate-constructed, 10,000-seat arena to watch Louisiana’s most feared criminals compete in harrowing events like “convict poker” (four prisoners sit around a card table and are ambushed by a bull; last one seated wins); “guts and glory” (a poker chip is tied to the forehead of a bull and inmates try to grab it off); and the perennial crowd pleaser, “bull riding.” Prisoners can win prize money, but have no chance to practice before entering the ring. The 12-year-old Mexican is a bullfighting prodigy.